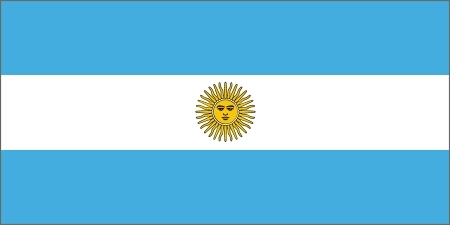 Argentina Flags for sale at SWI from $0.40 each from the below links. These Argentine flags are made of 100% polyester and come mounted on a staff, or with 2 brass grommets for easy pole attachment. Our Argentinan flags make great decorations for offices, classrooms, desk and table tops, or any special occassion. We can provide the Argentina flag in four sizes, and all are in stock and typically ship within 24 hours of ordering ..